Welcome to the official Tyrants of the Dead glossary. Herein you’ll find descriptions and blurbs for every major character, place, historical event, and artifact appearing in the Tyrants’ trilogy. This appendix is for all the folks who’ve read the books and for those who are thinking about it. Fear no spoilers! No major event taking place in any of the three books will be revealed. Andelusia Anderae – A young woman from the tiny Grae village of Cairn, Ande (as she’s known to her friends) dreams of a life that is not hers. She is the title character in Dark Moon Daughter. Archmyr Degiliac – Also known as the The Thillrian, The Pale One, and the Pale Knight. The son of a hated Thillrian lord, Archmyr murders so many of his father’s rivals as to be branded a butcher and forever exiled. He comes to prominence after being captured by the Furyon Empire and recognized for his ruthlessness. Arjobec – A captain in Furyon’s legion, the aging Arjobec serves as a guide and oftimes moral compass for his master, Dacin of Dageni. Bruced (Bru-sed) – Fiercest warrior of Gryphon, but soft-hearted and loyal. Bruced’s hatred of the Grae province of Mooreye is legendary. Dacin of Dageni – The youngest of the Furyon warlords…and the most powerful. Dacin was raised in the brutal Furyon province of Dageni, largest of the slaver colonies. He defeated the hated Davin Kal in the span of three years, and is swiftly recognized by the Furyon Emperor as the warlord most capable of destroying Graehelm. Daedelar – A swarthy Thillrian captain-for-hire, Daedelar boasts of having once sailed to Cornerstone and back. Dank – Also known as Dancmyrcephalis or the Little Man, Dank is an advisor to House Gryphon, a well-traveled sage, and (as some believe) a sorcerer dabbling in black magicks. His oaths to himself far outweigh any promises he makes to Graehelm or its lords. Emperor Chakran – Furyon’s suzerain. To seize the Furyon throne, Chakran allies with Malog, rumored stronghold of the world’s last (and most wicked) sorcerers. Chakran desires the rebirth of Tyberia, a legendary nation he believes is his birthright to rule. Emun Gryphon – Lord of Gryphon, and most popular of Graehelm’s Councilors. Garrett Croft – Friend of Rellen, and most feared soldier of Mormist. To earn redemption for crimes against Graehelm, Garrett makes an oath to Emun Gryphon to forever protect the Gryphon household. Ghurk Ghurlain – A captive in Thillria’s dreaded Sallow province, Ghurk is the son of a powerful Thillrian lord. Grimwain – A swordsman and fallen knight. After being exiled from Romaldar for making threats against the Romaldarian king, Grimwain travels east to the Mohrlahn, seeking the aid of the Anderae. Jacob Nure – Nephew to the ailing Grae king and renowned for his martial prowess, Jacob is closest in line to the throne. Jix – A diminutive Thillrian man in the service of King Orumna. Jix is tasked with fulfilling many of Orum’s strange requests. King Orumna – The most corpulent and ineffective king Thillria has ever known. King Orum prefers to eat his way to prosperity than do anything to advance his kingdom. Lord Ahnwyn – Lord of the Graehelm stronghold of Gallen Hold. Leader of the famed Triaxe Knights. Warden of the south. Lord Lothe – Lord of Graehelm’s Barrok province, and the general of Graehelm’s northern army. Lord Tycus – An ambitious Thillrian lord. Tycus is often fair, but just as often harsh. Marid of Muthem – A young soldier in the employ of Duke Ghurlain, Marid is woefully in love with Andelusia. Marlos Obas – A cranky captain of the Gryphon guard, Marlos is appointed by Rellen to lead a cadre of soldiers to Mormist. Myklokain – Rumored to be a member of Grimwain’s family, Myklokain is long-dead, but not. Nentham Thure – Lord of the hated Grae province of Mooreye. Tall and crow-beaked. Councilor Nentham is universally disliked by his peers and rumored to have designs on Graehelm’s throne. Nephenia of Yrul – Daughter to a high Yrul lord, Nephenia is married off to a Romaldarian noble in the hopes of gaining Yrul’s complicity during the war to come. Ona – A mysterious and stunningly beautiful young woman from far southern Thillria. Rellen Gryphon – The only child of Emun and Sara Gryphon, and the youngest of the high captains in Graehelm’s military. Revenen – The Lord of Malog. Eldest of the Archithropian line. Saul of Elrain – After Saul’s family is displaced by raids from the north, Saul bargains with Elrain’s king. In return for the promise of his family’s safety, he accepts the grueling task of delivering an important letter to the lords of Graehelm. Sara Gryphon – Emun Gryphon’s wife, and the wisdom behind many of his policies. Ser Arjobec – A Furyon captain, guide, and among the most trusted of Dacin’s advisors. Ser Endross – Hardiest (and luckiest) of Ahnwyn’s knights, Endross is perhaps the noblest soul in all of Graehelm. The Ur – An ancient civilization from beyond, beneath, and between the spirit realm, the Ur desire vengeance against mankind for removing them from power. The Uylen – A race of cursed humans living in a haunted Thillrian forest. In recent years, it’s rumored the Uylen have wandered far from home seeking fresh prey. The Warlock – The son of a powerful Archithropian decendant, the Warlock’s plans for Thillria are far-reaching. Thresher – A masked iron knight in the service of Romaldar, the terrifying Thresher accompanies Unctulu and relentlessly hunts Romaldar’s enemies. Unctulu – A loathsome servant of Romaldarian lords, Unctulu is entrusted with the care of the Needle, an ancient Ur artifact. Vom – A powerful pupil in Revenen’s care, Vom trails Emperor Chakran throughout the war to ensure the Emperor follows Malog’s plans. Wkhzl – A weary old shopkeeper in the Triaxe fortress city of Kilnhome. The strange relics contained in his store are like no other in the world. Wrail – A wicked man from the nation of Romaldar, Wrail claims to possess powers of the Archithropian line. Archaeus – Capital city of Romaldar. Filled with white marble towers and elegant stone dwellings. Archaeus is also home to the dreaded Wolfwolde. Cairn – A small village in northwestern Graehelm. Andelusia’s home. Cairn is a peaceful place, but harbors more than a few dark secrets. Dageni – A smoking, pitted, volcanic province of Furyon, Dageni is home to tens of thousands of slaves who toil to extract precious Dageni ore.
Darken – A stinking, swampy forest in southwestern Furyon. Darken was once the site of an Archithropian burial ground, and is avoided by all wise folk. Denawir – Capital city of Thillria. Denawir’s gardens are legendary, but less so its king, Orumna. Elrain – Far north of Graehelm, Elrain’s colonies surround a massive lake. Scholars postulate Elrian was the site of the earliest battles between Archithrope and Niviliath. Furyon – Not quite the foul, reeking realm Graehelm’s lords predict, Furyon is a land of beauty and deep culture. Until, that is, Emperor Chakran remakes it to serve the war against Graehelm. Graehelm – The largest of the modern nations, Graehelm is ruled by both a king and an oligarchy of councilors. The Grae lands are largely inhabited by the decendants of Niviliath, the losers of an ancient war against the Ur-worshipping Archithrope. Grandwood – The vast forest in Graehelm’s heart. Home to the hugest trees in all the world. Grandwood itself is larger than most smaller nations can claim. Gryphon – The home of Eumn, Sara, and Rellen Gryphon. The old-world city is placed strategically between the Graehelm capital and the troublesome Mooreye province. Illyoc – The largest city in Furyon. During the Emperor’s rule, Illyoc is transformed from a peaceful trade hub into a stronghold of war, complete with vaulting black towers and cathedrals to house Furyon’s nobles. Malog – The black citadel of Furyon. Home to the direct decendants of Archithrope. Not built by mankind. 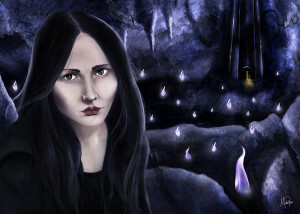 Midnon – A black fortress hidden somewhere in Thillria, Midnon is the Warlock’s stronghold. Mooreye City – With seven gates and mighty walls, Mooreye City, citadel of Nentham Thure, has long been a source of worry for the rest of Graehelm. Morellellus – Furyon’s prime trade port, and the harbor for its armada of warships. Morellellus was once a simple trade port, but has been completely remade by Chakran into a fearsome city. 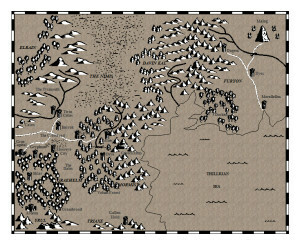 Mormist – The mountain and forest realm of eastern Graehelm. Mormist is the buffer land between Graehelm and the sea (and Furyon). Romaldar – A realm of vineyards, rolling hills, and silver lakes. Romaldar’s people have always envied Graehelm, but have long lacked the power to make a meaningful challenge to their northern neighbor. Sallow – In Thillria, no place is more feared than Sallow. Its twisted trees and slate-capped mounds have long sheltered the dark, dismal Undergrave. Shivershore – Southernmost province of Thillria. Hard to reach, harder to endure. Lying next to the Selhaunt Sea, Shivershore lives up to its name. The Cornerstone – An island created by the Ur. A twisted, magical place where nothing ages. The site of the bottomless pit built by the Ur to ensure the doom of mankind. The Nether Chamber – A dungeon far below Romaldar’s capital city, Archaeus. Thought to be a breeding cavern for the spirits of the Ur. Thillria – Weakest of the world’s nations, Thillria’s sometimes brutal climate and lack of resources render it uninvolved in the affairs of more powerful lands. Triaxe – Mountainous home of the sturdy Triaxe knights. Southernmost vassal of Graehelm. Triaxe is also home to Erewain, largest mountain in the known world, and the legendary site of mankind’s final battle against the Ur. Verod – A crumbling castle in westernmost Mormist, Verod was once home to a huge Graehelm garrison, but no longer. Yrul – A great valley surrounded by sharp, jagged peaks, Yrul is home to a proud, strong people who are hated by most civilized lands. Archithropian War – The two thousand year-long war between rival nations, ended only after millions of deaths, countless cities turned to ash, and entire swaths of landscape brought low. Destruction of Davin Kal – The precursor to Graehelm’s invasion. Emperor Chakran ordered the death of the Davin Kal as training for his protege, Dacin of Dageni. The Rebuilding of the Five – Legend tells that during the Archithropian war, the lords of the east, having failed to subdue Niviliath after a thousand years, chose to unearth and remake five artifacts of the Ur and use them to destroy their enemy. In truth, only one was remade. The others were simply found…and used. The End of Tyberia – Little is known about the supposed realm that once stretched from Elrain to Thillria. Scholars say it was a powerful kingdom fractured and divided by Graehelm lords of old. This claim alone is enough for Emperor Chakran to propel Furyon into war against the Grae. The Ur Blade – Though never called by its true name in the books, the Ur Blade was fashioned to be the destroyer of all other swords. When used in battle, the Ur Blade can summon Ur fire and draw upon its wielder’s passion in such a way as to make them nearly invincible. The Eye – Some believe The Eye was one of the five artifacts left behind by the Ur. This is untrue. The Eye was fashioned by men, and is merely inhabited by the Ur. The Greyblade – Fashioned from a fallen meteorite by a master Romaldarian weaponsmith, the Greyblade is given to a powerful knight during his search for Grimwain. The Moonblades – Grimwain’s twin swords. Pale as milk. Almost translucent. Utterly unbreakable. The Needle – Several Needles have been found since the fall of the Ur, each with a different power. One in particular, the largest and most deadly, is unearthed by a Romaldarian knight in a graveyard under the moonlight. The Orb – Rebuilt twice since the fall of the Ur, the Orb of Souls was the prime weapon of Archithrope and of Malog. The giant black sphere, lined with pale tines at its base, feeds upon death in order to enslave the living and ultimately ensure the Ur will be resurrected. The Pages Black – A book of ten pages, each containing a different and increasingly more horrific power. The Ur despise the Pages, for the powers therein belong to them, and yet they adore whenever a mortal uses one of the spells. The Tower – A common misconception is that Malog is also the Tower. Untrue. The Tower lies in Thillria, existing as a conduit for the Ur to influence mankind, among other things. Wkhzl’s Dagger – A knife given freely away by the shopkeeper Wkhzl. It’s not meant to harm the living, but has a different purpose entirely. Tagged Appendix, Character Portraits, Dark Moon Daughter, Down the Dark Path, Nether Kingdom.